What is a Mississippi Month to Month Lease Agreement? 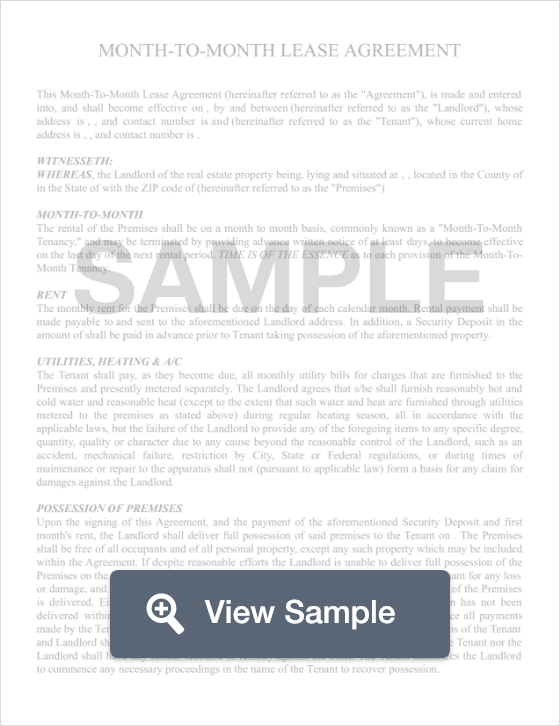 Mississippi Month to Month Lease Agreement: What Is It? In the state of Mississippi, a month to month lease agreement, also known as an at-will agreement, is a document that establishes a rental agreement between a landlord and a tenant. A month to month lease agreement is essentially a non-fixed term lease because even though the lease is month to month, it continues to renew at the beginning of each month until either the landlord or the tenant terminates the lease. These open-ended agreements can work well for both landlords and tenants because of the extreme flexibility. If either party decides that they no longer want to remain in the agreement, there is no penalty for terminating the agreement, as long as a written 30-day notice is provided. According to Mississippi state law, a tenant or landlord who wishes to terminate a month to month lease agreement must do so with a written notice at least 30 days before the effective date of termination. However, there is an exception to this rule. If either the tenant or landlord substantially violates one of the terms of the agreement, or put the health and safety of others in jeopardy, no notice is needed to terminate the agreement.